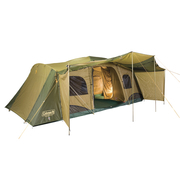 Back by popular demand and for a limited time only, the Traveller 3 Person Tent, is part of the Coleman Gold Series of tents. Celebrating ten years of the Gold Series, the tents that changed all tents in Australia and set the Gold standard. The Coleman Gold Series, is the top of the Coleman range with heavy duty flys, thicker floors, Circle Ventilation for better air flow and the WeatherTec system for great performance in all conditions.